Just a public service message: if you are going to the Ringling Bros. and Barnum & Bailey Circus and are wondering if you can bring your camera - the answer is YES. The box office told me NO. The back of my ticket told me NO. The website is unclear (it just says no commercial photography - which I took to mean Yes, but not if you make money off of it - which is why I called the box office). At the circus itself, they informed the audience that photography was allowed as long as you don't make money off of it (for personal use). Arkadium is testing a new flash game for the next three Fridays at Shake Shack in New York City. The first fifty people to show up, play the game, and provide some feedback gets a free burger. Might be fun if you're in the area. 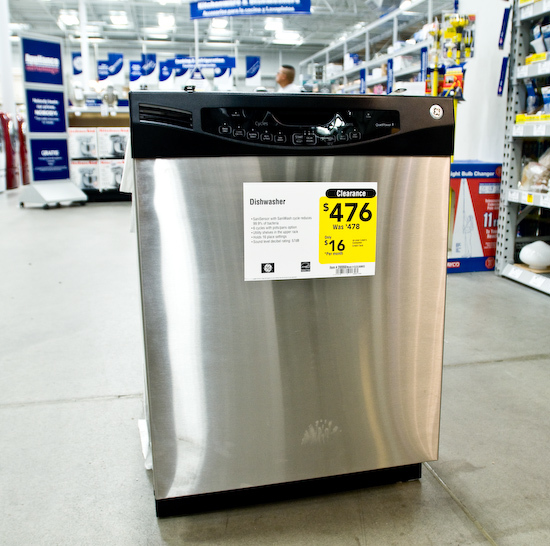 The other day Tina and I were at Lowe's and she noticed this dish washer on clearance. They took a whole $2 off a $478 appliance. Now that's a deep discount. 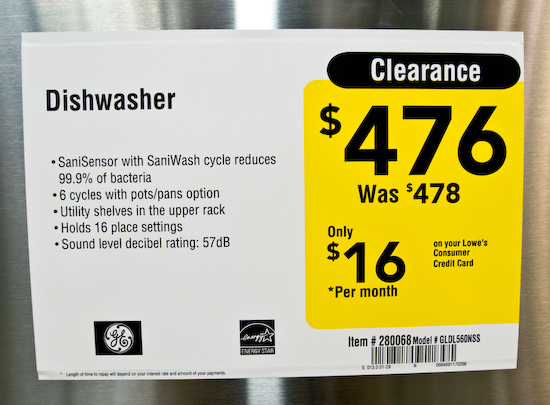 If they're trying to get rid of that dish washer, they should probably drop the price by more than 0.42%. 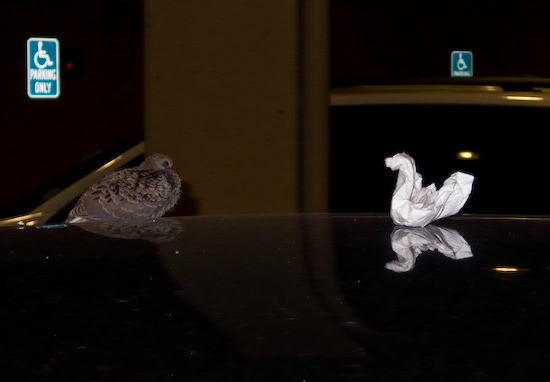 So, while we were exiting Dynasty Chinese Seafood Restaurant in Cupertino Square (formerly Vallco Mall), we passed a car with a bird sitting on top. We stopped to look at it when Dave Menestrina pointed out that the crumpled piece of paper that was also on the roof looked like a paper crane from his position. I walked over and indeed it was bird shaped! I had to take a picture. When we walked away, the bird still hadn't moved, so I suggested that the bird might be a fake. Dave Weldon then quipped, "Yeah, the owner put it there to attract paper birds."